Morey Middle School is located in the heart of the Capitol Hill neighborhood and is bordered by 13th and 14th Avenues between Clarkson and Emerson Streets. Since its founding in 1921, Morey Middle School has remained committed to serving the unique and diverse needs of the surrounding neighborhood. 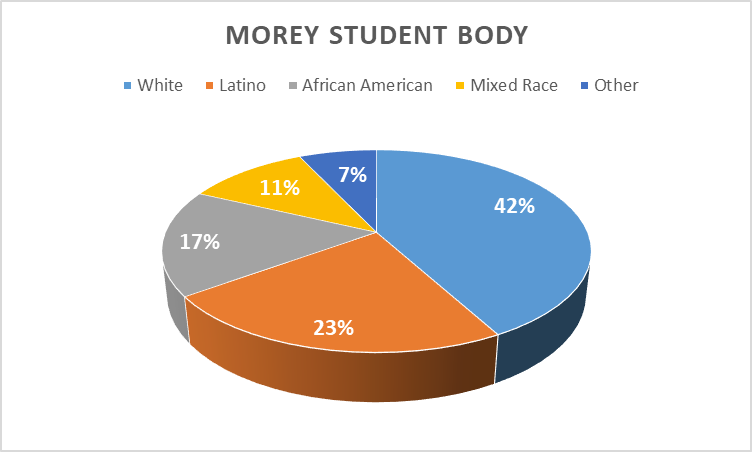 Today, Morey is more diverse than ever with a student body that is one of the most unique in the Denver Public School system, serving the immediate area as a traditional neighborhood school, while also serving greater Denver area with a Highly Gifted and Talented magnet program. Students from the immediate neighborhood and across the district are integrated into the same school community. At Morey, we build on every child’s unique gifts so each person becomes a self-directed, socially conscious, educated member of our diverse community, both inside and outside of the classroom. At Morey Middle School, serving the diverse needs of our student body is an exciting opportunity, but it can also come with challenges. With such a diverse student body, Morey is committed to ensuring each child’s academic and social needs are met. The Morey Middle School Parent Teacher Organization (PTO) fundraising supports the Morey community through teacher mini grants that provide for books and classroom materials, as well as school-wide. Some of the school-wide efforts include offering scholarships to students who cannot afford to go on field trips. Often PTO provides meals for staff on days teachers stay late for school functions (like parent/teacher conferences, Open House Night, etc.) PTO currently funds a literacy paraprofessional, who works 1:1 and in small groups targeting literacy instruction to close reading gaps. For 2019, the PTO has established a new goal of raising $80,000 to support additional classroom staffing. With these new resources Morey can hire additional paraprofessionals (in-classroom aides) to provide one-on-one intervention with students in reading and math. With this intervention, all students at Morey will succeed, regardless of socio-economic background, race or academic ability. Your support will make this vision a reality. Located in one of the most population-dense areas in Denver, Morey’s immediate neighborhood is home to nearly 40,000 residents and dozens of businesses, retail, restaurants and bars. As a busy crossroads, over 15,000 cars per day drive down 13th Avenue, right by Morey Middle School property. By supporting Morey with sponsorship, you are not only serving the needs our student community, you are also gaining prominent exposure to both the local neighborhood and thousands who pass through Capitol Hill every day. For a $150 annual donation, you can sponsor one of our school-wide teacher appreciation events. Thank you for supporting Morey Middle School.